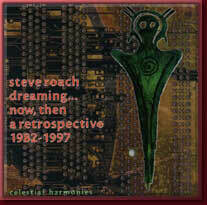 This double CD presents selected pieces from Steve Roach's large body of work on the Fortuna Records label. Carefully selected and sequenced by the artist himself, and digitally remastered, Disk 1 presents the rhythmic-electro-tribal-trance side of his work in nearly chronological order, starting with The Ritual Continues from 1982 and winding down with a previously unreleased live montage from 1997. 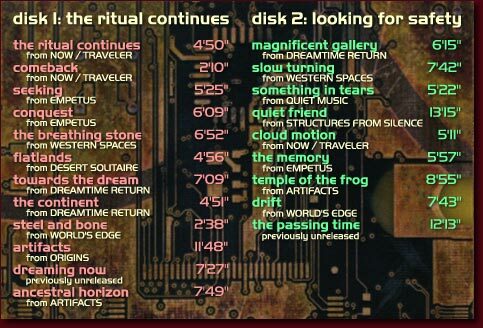 Disk 2 presents an overview from the vast atmospheric soundworlds that only Steve can brew up. A stirring, spiraling, unreleased archive piece closes the second disk in a subtle yet profound way, illustrating why this influential artist continues to inspire listeners world wide. These photos were excavated from deep within the Timeroom's catacombs, and brought together to present an overview of some highlights over the past years. The ritual continues . . .